There are few things more exciting to many kids than getting to go on a boat. Not only is it a great way to have fun and enjoy the outdoors, it can be a great way to teach kids about safety, teamwork and responsibility. When kids are introduced to safe boating at an early age, they are much more likely to become safe boaters for life. Life Jackets and Sunscreen are a MUST! Alcohol is NOT! Whatever the age, all children and adults should wear age-appropriate life jackets – no exceptions. The better the fit and comfort, the less fussing and complaining you’ll get, so invest in a good quality, comfortable life jacket. Remember, what you do while boating with your kids teaches your kids by example. So, put on a life jacket yourself and leave the alcohol at home. Before strapping on the life jackets you need to slather on the sunscreen. Getting sunscreen on a bunch of wiggling kids is real work, but make it a rule – no sunscreen – no boat. Top it off with protective clothing, hats and sunglasses. Next, bring on the gear and provisions. Assign each kid some age-appropriate tasks like counting out 2-3 bottles of water for each person, helping make sandwiches, and packing healthy snacks. Someone also needs to be responsible for making a list of what you’re bringing with you so you don’t accidently leave things behind. More mature kids can also help check the weather forecast, make up your Float-Plan and communicate your plan to friends and relatives. Be prepared to spend more time preparing, packing, unpacking and cleaning up than boating itself. The smaller the kids, the shorter the trip should be. 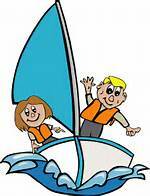 Take things slow and teach boating safety in increments – what things are called, what they do, etc. Kids want to learn how to do things themselves, so encourage them: give kids short lengths of rope and begin teaching them how to tie basic knots, let them help chart your course, check your lights, first-aid kit and other safety gear, and show them how to use your GPS. Of course, what do kids want to be allowed to do more than anything? Drive the boat! Letting your kid drive the boat will give them a feeling of independence, control and responsibility. Florida has no minimum age requirements to operate a boat. A child may be allowed to “drive” under the supervision of a qualified, responsible adult who is responsible for the safe operation of the vessel (a person who is least 18 years old who is either exempt from the educational requirements or who possesses the required Boating Safety Education Identification Card). Use this time to teach kids how to safely operate the controls, how to read channel markers and how to operate around other boats with courtesy. Heintz & Becker hopes that parents will find this information useful. Remember, be a good example, teach and explain, and give kids a chance to help and be involved. We thank all of our readers who have helped to make our boating safety series a big success. As always, Heintz & Becker’s experienced boating accident attorneys are standing by if you are ever injured as the result of someone else’s careless boating.